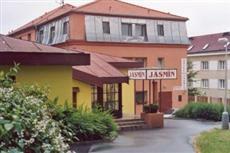 Jasmin offers affordable Prague hotel accommodations, in a quiet residential neighborhood situated just 20 minutes from the historical part of Prague. The main monuments are also easily reachable by public transportation and in the hotel surroundings guests will find many bars and restaurants, a swimming pool and several discos. Providing comfortably-equipped rooms, easy access via public transport and a welcoming personnel, booking a rooms at the Jasmin Hotel guarantees a pleasant stay in the Czech capital. This Prague city hotel offers guests a number of services and amenities including a great restaurant and business facilities as the restaurant can become a meeting room accommodating up to 72 persons. Banqueting services and group meals are available upon request available on the beautiful terrace in summer. Hotel facilities include a bar, a nice garden, gift and souvenir shop, currency exchange office, laundry service and fax machine. The multilingual staff will be pleased to provide city maps and tourist information or a private guided tour according to your wishes. Free wireless Internet access is also available at the reception and restaurant area.